This is the second part in a two-part discussion about my visit to Westwind Milling Company in Linden. I already wrote about the history of the Westwind mill and mills in general. Today I am going to focus on the specifics of milling grains at our local certified organic stone mill. For those of you who participated in the Local Table Passport hosted by the University of Michigan, Westwind Milling Company is already a familiar part of the locavore food scene in SouthEast Michigan. Today the Purdy farm is one of 16 farms that support the mill. They are very careful to spread out their risk, “because if we got caught with drought or wet harvest or any number of other things we would be in trouble,â€ Purdy said. They visit the other farms on a regular basis and mill a variety of different wheats, corn, buckwheat, rye, spelt and barley. When grain is harvested, for example hard red spring wheat in early August, it is stored in bins until the second week of September to level the amount of moisture in the grains. As the autumn progresses, the stored grains become more consistent for baking uses because this equalizing has taken place. Purdy describes Kamut wheat, which was found stored in an Egyptian tomb and sprouted thousands of years later, as an example of the grain’s ability to store forever under the correct conditions. Only once the seed coat is broken does the grain begin to oxidize and lose nutrition. This degradation of enzymes is why Westwind Millings Company’s “big thing is from wheat to bread in a dayâ€ when they are making their own baked goods. “We are concerned about losing nutrition. We feel that there are more enzymes in fresh flour.â€ Given their oven is 50 feet from the mill - that is an easy choice to make. When the grain arrives at the mill, it is transported within the building via elevator legs. The elevator legs have a series of metal cups that can lift up to 250 bushels of grain an hour from the basement to the second floor. At the top of the leg is a distribution arm that pours the grain into a bin, from where it can be moved again. As Purdy explains, “Even though it is redundant, if I want to get grain to the other end of the building, I lift it and drop it and lift it and drop it till it gets to the right spot. It doesn’t matter because (the elevator legs) are running all of the time. When I am milling they are running, so I might as well utilize them.â€ The grain to be milled is kept on the second floor and is transported to the grinding stones via gravity. The entire machinery of the building is run on a 15-horsepower motor. The grain is scoured, removing the tiny hairs from the kernel and broken seeds, before it is poured into the mill. Then the grain enters the mill where it is ground between the run stone and the bed stone. Then the meal and the flour are blown up and shifted, separating the unbleached flour from the wheat germ. 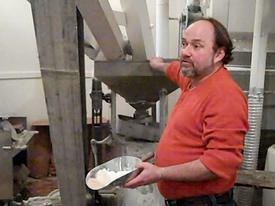 The Purdys' current project is to finish building a separate area for gluten-free milling. 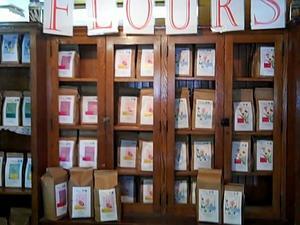 Linda Purdy is hopeful that, within two months, they will be up and running for a gluten-free mill. They will be adding certified organic gluten free buckwheat (which they currently grind, but there is a lot of gluten flour dust in the milling area), garbanzo and rice to their extensive list of offerings. They plan to offer amaranth and millet as well. I highly recommend swinging by their mill for a tour. It is fascinating and you can fill your car with goodies to take home! Here is the link to the annarbor.com article!